Tour 2017 hots up with the return of our popular production of Rossini’s Il barbiere di Siviglia, one of the world’s best-known and loved operas. From the unforgettable overture, to the unmistakable refrain of ‘Figaro, Figaro, Figaro’ in the aria ‘Largo al factotum’, Il barbiere di Siviglia features some of the most famous music in the operatic repertoire. The opera follows the cunning servant Figaro’s efforts to win his master, Count Almaviva, the hand of the beautiful Rosina. Rosina is being kept prisoner by her guardian, Dr Bartolo, who intends to marry her himself. Figaro uses his ingenuity to devise elaborate ways for Almaviva to meet Rosina, but soon finds that the crafty Rosina is more than a match for him. 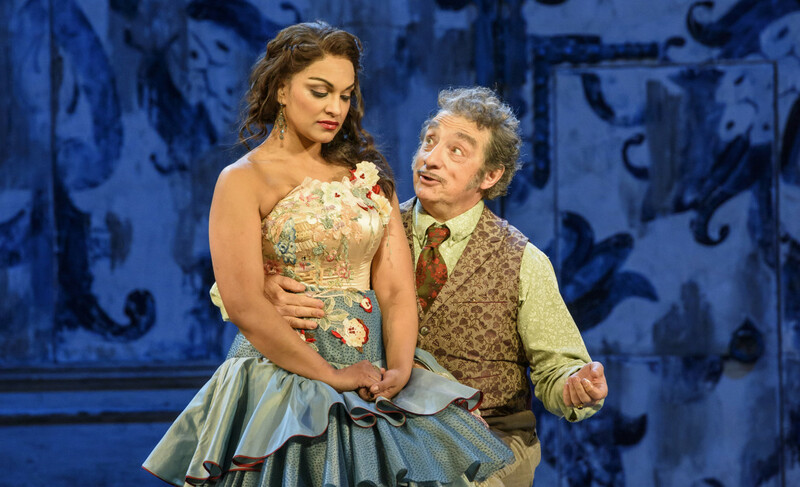 Danielle de Niese (Rosina) and Alessandro Corbelli (Dr Bartolo) in the Festival 2016 production. Photo: Bill Cooper. The opera is based on the first of the ‘Figaro’ trilogy of plays by French dramatist Beaumarchais. The trilogy was also the inspiration for Mozart’s Le nozze di Figaro (The Marriage of Figaro), which you can see in cinemas this Tour. 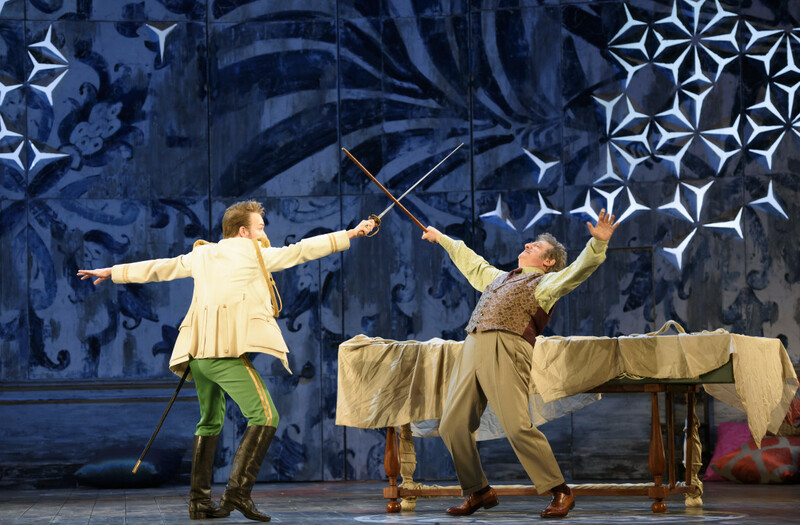 ‘There’s just something so accessible, both musically and dramatically, about Il barbiere di Siviglia’ says Dramaturg Cori Ellison, ‘the music is so sparkling and just infectious, you can’t not be in a good mood when you hear it’. 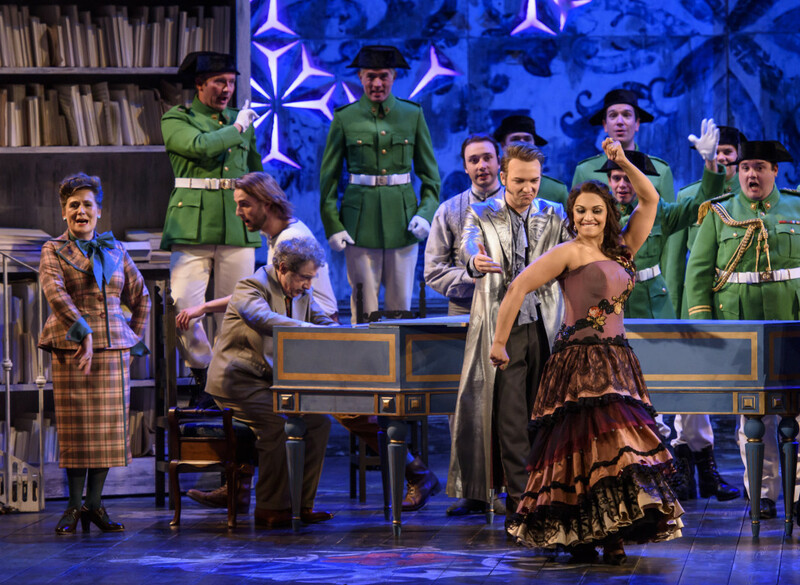 You can find out more about Il barbiere di Siviglia in our in-depth podcast, presented by Katie Derham with insights from Stephen Wadsworth, Director of Opera Studies at The Julliard School, Francesco Izzo, Professor of Music at Southampton University and the internationally renowned soprano Danielle de Niese. Taylor Stayton (Count Almaviva) and Alessandro Corbelli (Dr Bartolo) in the Festival 2016 production. Photo: Bill Cooper. This Tour revival is the first opportunity to see this popular production on stage since its Festival 2016 sell-out run. Festival 2016 audiences were thrilled by the production’s alluring staging, ‘…the eye is constantly delighted and dazzled’ said The Independent in their 5 star review, also calling it ‘a triumphant celebration of Rossini’s musical genius’. Annabel Arden’s production takes inspiration from the opera’s Andalusian setting, ‘We wanted to evoke the feeling of Spain,’ she explains, ‘so we took a few elements which to me say southern Mediterranean: blue and white tiles, and flowers. Also balconies are very important in Spain, and one figures significantly in the story’. Director Annabel Arden is known for the magical quality and bold theatricality of her productions. She previously directed L’elisir d’amore, which premiered on Tour 2007 and returned in 2013. The cast will be led by four singers new to Glyndebourne: American baritone Tobias Greenhalgh (Figaro), American tenor Jack Swanson (Count Almaviva), Italian mezzo-soprano Laura Verrecchia (Rosina) and Italian baritone Marco Filippo Romano (Dr Bartolo). Ben Gernon will conduct the Glyndebourne Tour Orchestra. 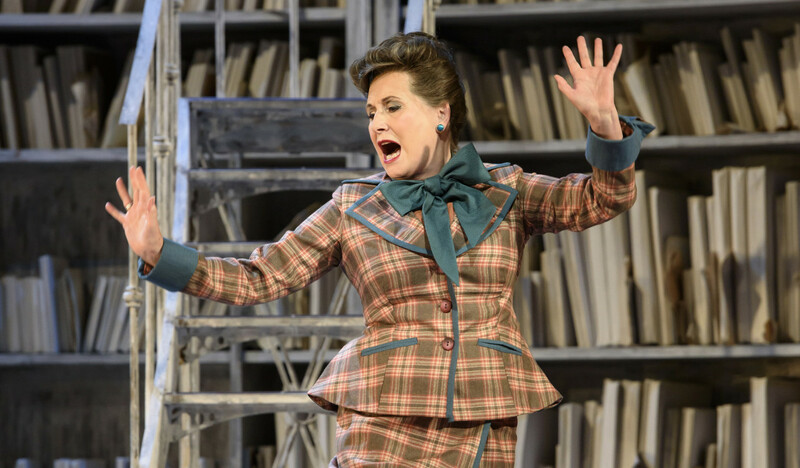 Janis Kelly as the ‘scene stealing’ Berta in the Festival 2016 production of Il barbiere di Siviglia. Photo: Bill Cooper. Janis Kelly returns from the Festival 2016 production as the ‘scene stealing’ (The Guardian) Berta, Rosina’s faithful governess. Keep an eye out for her aria in Act II, which was described by bachtrack as ‘something quite wonderful’. Il barbiere di Siviglia features some stand-out group numbers. Photo: Bill Cooper. The opera features several impressive group numbers, requiring precise musical timing from the singers, as their verses overlap and interrupt one another. The end of Act I, when the Officer of the Watch bursts in on the characters in an intimate scene, is a great example of this. Another musical moment to listen out for is Rosina’s aria ‘Una voce poco fa’, a vocal firework display of technical brilliance. Arden’s staging is motivated very much by Figaro himself, ‘he introduces himself by basically saying, “I can go anywhere”’ – keep your eyes peeled for the crafty barber as he pops up in the most unexpected places throughout the opera. 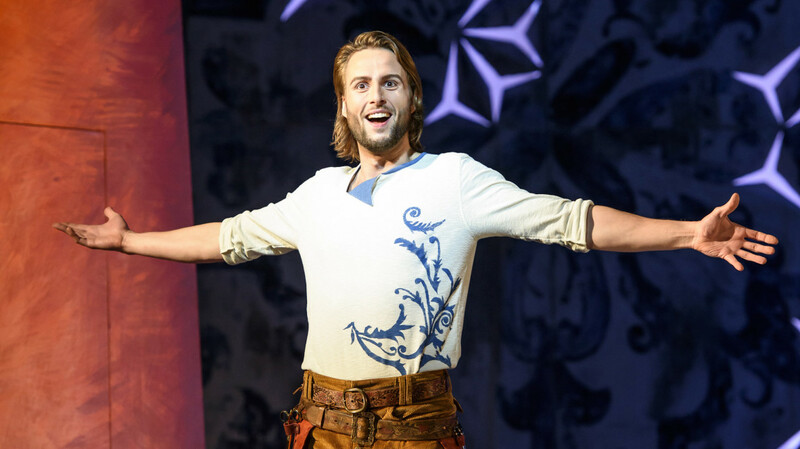 Björn Bürger as Figaro in the Festival 2016 production of Il barbiere di Siviglia. Photo: Bill Cooper. Saturday 14 October, 3.00pm. Tickets £5 for ticket holder for that day’s performance. £10 tickets, for children aged under 18, are available for Il barbiere di Siviglia on Wednesday 25 October when buying one or more full price ticket(s) priced £44 or above. The children’s ticket(s) will be allocated in the same seating area as the full price ticket(s). For more information please call the Box Office on +44 (0) 1273 815 000. Want to find out what happens to Figaro, Rosina and the Count next? Mozart’s Le nozze di Figaro continues their story. This autumn you can see Le nozze di Figaro (captured live at Festival 2012) in selected cinemas around the country as part of Tour 2017. Il barbiere di Siviglia is on stage at Glyndebourne from 8 October-28 October 2017, before touring to Canterbury, Woking, Norwich, Milton Keynes and Plymouth as part of Tour 2017.